Airing introduces a low-cost, disposable CPAP solution to liberate those affected by OSA. The company will launch an Indiegogo fundraising campaign in June to fund the prototype development. "I think it's going to be wonderful for people. For the first time we have a treatment that patients will be willing to use. I think Airing will have a tremendous impact," said Dr. Jeffrey Bass of Brigham & Women's Hospital. Airing LLC is introducing a revolutionary device for the treatment of Obstructive Sleep Apnea (OSA). 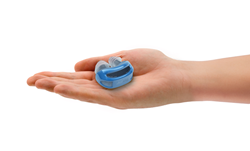 The device aims to replace uncomfortable Continuous Positive Airway Pressure (CPAP) masks with a micro-CPAP device that weighs less than an ounce, fits right into an OSA patient’s nose, has no cords or hoses, and is disposable. Today, while it is estimated that 22 million Americans suffer from sleep apnea, most who are diagnosed are in “non-compliance,” meaning they choose not to comply with the prescribed therapies available for addressing it, CPAP machines. Typically, these CPAP machines consist of hoses, cords, masks, and straps around the head, making sleeping uncomfortable for those with sleep apnea, as well as for loved ones and family members in proximity. Unfortunately, non-compliance can cause serious health problems like high blood pressure, chronic heart failure, atrial fibrillation, stroke, and other cardiovascular problems. To address non-compliance, Airing has invented a breakthrough micro-CPAP device that is designed to fit into a patient’s nose without any of the cumbersome hoses, cords, or masks. Airing’s revolutionary design includes unique, battery powered “micro-blower” technology that blows the amount of air pressure prescribed by the patient’s physician into the airway to effectively treat OSA. Airing was founded by Stephen Marsh, an established entrepreneur and innovator who is the named inventor on more than 75 patents in the areas of electronics, energy, health care and consumer products. While conducting research in another field, Marsh saw the applicability and need for a new CPAP solution due to a personal connection with the dangers of breathing disorders. Marsh then shared his design and concept with medical professionals and knowledgeable medical experts in the area of breathing disorders, all of whom fully endorsed his approach and proposed solution. “I think it’s going to be wonderful for people. For the first time we have a treatment that patients will be willing to use. I think Airing will have a tremendous impact,” said Dr. Jeffrey Bass of Brigham & Women's Hospital. This innovative solution is the result of Marsh’s extensive research in the area of micro-fluidic pumps in the Micro Electro Mechanical Systems (MEMS) space which identified a host of inefficiencies and limitations with current solutions, and led to Marsh’s design for a better micro-fluidic pump design, a design that works just as well moving air. The “micro-blowers” solution in Airing benefits from advances in the “Roll to Roll” (R2R) manufacturing process, which allows for inexpensive mass manufacturing of the solution, and which will allow Airing devices to be low-cost and disposable. The result of all this innovation will be healthier lifestyle, better compliance with CPAP therapy, and a better night’s sleep -- for those afflicted and for loved ones who are impacted by snoring and wakeful nights. “As someone with a family member who suffers from sleep apnea (my brother), I understand the potential serious health impacts of this condition,” said Marsh. To build a proof-of-concept prototype, Airing is conducting a crowdfunding effort on Indiegogo, which will take place in June, 2015. To learn more about how to contribute to this effort, which will help millions of people live healthier and more productive lives, visit http://www.fundairing.com.